Laughter 4 Executives South Africa (Pty) Ltd prides itself in being a client-focus company. Honesty and integrity form the basis of all their dealings and they are committed to provide quality Laughter Coaching workshops, seminars and Corporate training. Our Business philosophy are founded on our passion for people,presenting quality laughter coaching workshops, partnerships with Corporate Wellness programs and Corporate Training. Laughter 4 Executives South Africa (Pty) Ltd were established as a holistic corporate wellness consultancy company, where we are improving people’s lives through Laughter coaching. We are becoming one of South Africa’s leaders in Laughter Coaching. 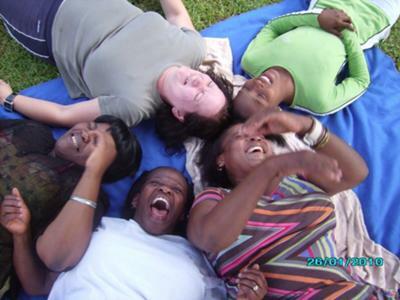 Laughter 4 Executives South Africa (Pty) Ltd is much more than Laughter Coaching, we are about developing and empowering people with de-stressing and Laughter techniques. We are using unconditional laughter Techniques through a holistic approach to stress-management, Team building with a difference and other innovative Laughter coaching Products that were especially developed for the corporate market. Laughter 4 Executives South Africa (Pty) Ltd has an national client base of NPO’s, NGO’s, Government, the Public Sector and Corporates. Laughter 4 Executives South Africa (Pty) Ltd was started by Founder and director Hendrik Visser. He is also a Social Devolpement Entrepeneur. Do you want to bring in fun and joy into your corporate team building workshops? Try Laughter Coaching where we laugh without any humour, comedy or jokes. You will learn how to breathe properly, do gentle stretching exercises and breakdown all boundaries with unconditional laughter. After the workshop/s your team will feel energized, positive and very relaxed. Laughter Coaching is being scientific researched by most major Universities around the globe. It is practiced in 65 countries around the world and is non-political and non-religious. Laughter Coaching have a strong anti-depressive effect. In Today’s corporate world, there are Psychological issues that are increasing and are often cited as a reason for absenteeism at work. We know now that stress is causing more than 90% of absenteeism at work. Stress and job burn-out describes total exhaustion and can show itself alongside depression, Anxiety attacks or with various physical symptoms. It gets serious when staff is unable to cope with their everyday life and their own mechanism of dealing with everyday stress. What is Laughter Coaching and the progress of a Laughter Coaching workshop? 1. We laugh without humour, comedy or jokes. 2. We have eye-contact the whole time. 3. We do childlike exercises and release the inner child during the exercises. 4. We do breathing exercises combined with gentle stretching exercises. 5. We do positive affirmations between every exercise. 6. We start with fake laughter, but real laughter quickly develops. 7. We do laughter meditation session where we lie on the floor with lots of real laughter. 8. After the Laughter Meditation session we will have a guided relaxation session where everybody will completely relax! 9. After the guided relaxation we will have a grounding session with the HO, HO, HA, HA Dance. 10. Afterwards we will have a Questions and Answer session. 3. Laughter foundation programs for the corporate world. 4. 2 Day Certified Laughter Leadership programs for the business and corporate world. 5. Laughter Team Building workshops and seminars. 6. One-on-One Laughter Coaching Programs. 7. Sales Targeting Laughter Coaching Workshops. 8. Conflict Laughter Coaching Workshops. 1. Pick and Pay Head-office. 17. Eastern Cape Gay and Lesbian alliance. 18. Education Department of the Western Cape. 19. Nelson Mandela Metropolitan University. 20. University of Technology Cape Town. 21. Western Cape South African Police. 22. South African Police Woman’s Network.